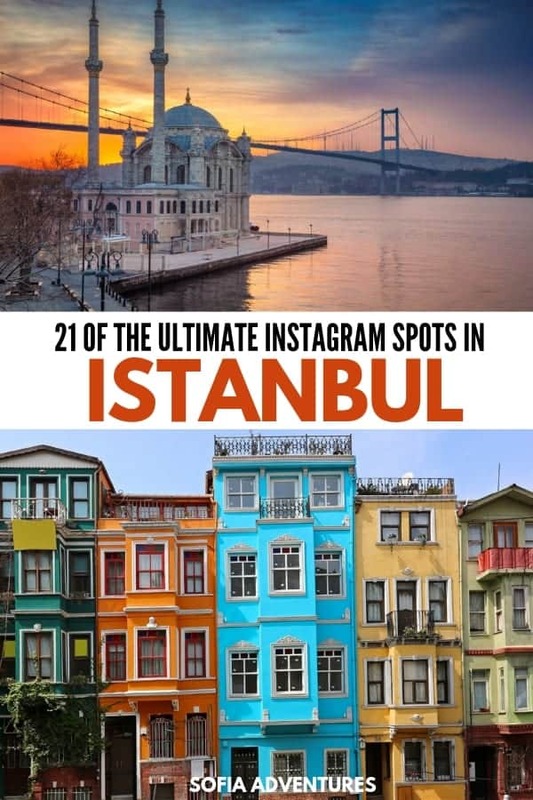 21 Most Instagrammable Places in Istanbul: Photo Spots Not to Miss! In my opinion, Istanbul is one of the most magical cities in the world. Built on the Bosphorus, this city spans Asia and Europe, East and West, and this diversity is present in every detail. Whether it’s the grand things, like the minaret-studded skyline or the beauty of the Bosphorus River, or the tiny details, like the street cats and tulip-shaped teacups, Istanbul will surely impress. The famous Rainbow Stairs are one of the most Instagrammed places in Istanbul. Unfortunately, the location has always been a little difficult to find, so on my last trip to the city I made sure to note down a useful address for this guide. There are a couple of Rainbow Stairs in the city. I’ve listed two. The first one I’ve listed below is the most convenient one as it’s near Süleymaniye Mosque and in the heart of Sultanahmet. However, you can also find some near the Istanbul Modern, if you were walking towards Dolmabahçe Palace. This photo above is from the 2nd listed staircase. Location: Demirtaş Mahallesi, Arıcılar İş Hanı 24 Prof, Ord. Prof. Dr. Cemil Birsel Cd, 34611 Fatih/İstanbul, Turkey (This is the address of the mobile phone accessory store, right next to the staircase). Note: In addition to the rainbow staircase, this is also where you’ll find the famous rainbow umbrellas and other colorful overhead things, so keep your eyes peeled and your creativity ignited! If you follow the Rainbow Staircase, you’ll be on your way up to the beautiful Süleymaniye Mosque, which is a little more off the usual tourist trail than the Blue Mosque. You’ll still be around other tourists, but not nearly as many. Bonus – the coffee shop Bab-i Ali Kahvesi offers stunning views of Süleymaniye Mosque with Turkish breakfast, snacks, and tea, so it can be perfect to get that ‘breakfast with a view’ shot that is so popular on Instagram. It’s a little pricy because of the view, but it’s worth it! Çukur Cuma Street is one of the most delightfully Instagrammable places in Istanbul. It’s the unofficial antiques district of Istanbul, and you’ll find the street in various states of lovely disarray, with vintage goods beautifully on display. That’s why this street is also on our Turkish souvenir and Istanbul shopping guide. There’s a beautiful green vintage car that’s often on this street too, right next to a bunch of ivy – perfect for whimsical Instagram shots. In fact, this whole area is really perfect for it. This is where I stayed when I was in Istanbul last year. Super conveniently, it’s right on Çukur Cuma Street, the most Instagrammable street in Istanbul. This boutique design hotel used to be a hammam, and they’ve retained the original details in the beautiful, understated lobby. Check prices and book in advance here. Bonus tip: When I went in September 2017, they were still working on opening the on-site hammam, but I’ve heard that it’s now open! This beautiful mosque on the water is one of my favorite places in all of Istanbul, especially with the gorgeous Bosphorus Bridge stretching between Asia and Europe in the background, one of the only bridges to span two continents. If you want a beautiful shot like this with a perfect glassy reflection, you’re not going to get that in the Bosphorus – it’s far too rough. Instead, you’ll have to wait for a puddle like this to form after a storm. Views are best at sunrise and sunset, though sunrise will be far quieter. It’s a little out of the way, but well worth it. The views here are great year-round, but we were truly shocked at how beautiful the mosque looks on the Bosphorus in the Istanbul winter. There are several “umbrella streets” in Istanbul, just like the Rainbow Staircases, but I’m partial to this one in Kadıköy as it’s on the Asian side where fewer tourists go, and I like that the umbrellas are more random and whimsical as opposed to the standard stripey rainbow ones you see everywhere these days. You’ve likely seen photos of a gorgeous breakfast spread on the rooftop with Istanbul’s two most famous mosques, Hagia Sofia and the Blue Mosque, in the background. Well, there are several hotels that serve up breakfast with a view, but perhaps the most beloved Instagram spot in Istanbul is at the Seven Hills Hotel. Luckily, staying here is actually surprisingly affordable – click here to check prices and book in advance, as it’s quite popular. I’ll admit – it’s not easy to get a perfect shot of Galata Tower from up close. There are simply too many buildings around it and it is too tall to get a great photo of it from nearby. To get this iconic shot of Galata Tower, just walk to the tower and then walk out from one of the streets emanating out from it until you reach the vantage point you want. 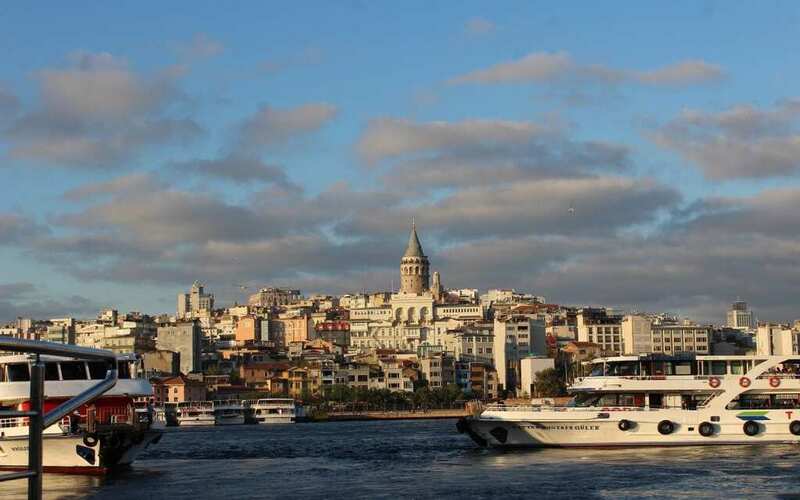 Otherwise, you can also get great shots of Galata Tower with a good zoom lens from the Sultanahmet side of the Galata Bridge, or while you’re on a ferry on the Bosphorus. Balat is a traditionally Jewish, now hipster-y neighborhood in the heart of Fatih, the neighborhood next to Sultanahmet on the Golden Horn. It’s a bit out of the way and off the beaten path and is primarily popular with local young people and avid Instagrammers. This is where you’ll find some of the most colorful buildings in Istanbul. Generally, the buildings in Istanbul are not that colorful (the staircases and umbrella alleys are another story) so Balat is kind of unique in Istanbul. If you’re the kind of person who seeks out colorful buildings to be your Instagram spots, Balat is exactly what you want! Location: I don’t have an exact location of where this photo was taken, so you’ll have to explore the neighborhood of Balat and find it for yourself. Isn’t exploring part of the fun? If you want to see a real local side of Istanbul, you’ll want to check out Arnavutköy, a neighborhood famous for its wooden Ottoman mansions that dot the sides of the Bosphorus. You’ll also catch some locals going for a dip in the Bosphorus if it’s hot out! You may have seen this gate looking out onto the beautiful blue Bosphorus before on social media. Unfortunately, people can be quite stingy with geotagging, which I can understand for natural sites but is kind of silly in the middle of a city of 20 million. Luckily, we’ve done the legwork for you here wherever possible! This gate is located at the Four Seasons (the Bosphorus location, not the Sultanahmet one). You can find the address below. This beautiful and curious island tower is located 200 meters off the coast of the neighborhood of Üsküdar on the Asian side of Istanbul. There’s something about the minaret-studded skyline as the sun goes down that really gets me nostalgic for Istanbul. When I think about photography spots in Istanbul, this is one of the first places that comes to mind. You can get this exact shot of the Golden Horn of Istanbul all lit up at night by walking towards Sultanahmet from the Galata side on the right hand, lower level of the bridge. The courtyard of the Blue Mosque is perhaps one of the most famous Instagram spots in Istanbul, and when you look at the photo, you can see why – it has symmetry for days. This place is almost always swarmed with tourists and worshippers alike, so I recommend visiting as early in the morning as you possibly can. If you truly want no one in your photo, you’re going to have to wake up at dawn for it. The beautiful gardens of Dolmabahçe Palace are a wonderful respite from the hustle and bustle of Istanbul’s streets, and it’s full of great Instagram spots where you can get a unique shot. I recommend combining a visit here with the Ortaköy Mosque and the Rainbow Stairs, which are both close to this part of Istanbul. One of the most iconic Instagram shots you can get in Istanbul is the vintage Taksim tram. Several times an hour it makes its way up the mostly-pedestrianized İstiklal Caddesi, one of the most important streets in Istanbul. This tram navigates down İstiklal from Taksim square down to Tünel, so you can get shots of it anywhere along its route. Located just off İstiklal Caddesi, you could very easily skip Çiçek Pasajı if you didn’t know to look for it! This was one of my favorite hidden gem discoveries on my first trip to Istanbul – a lot of people don’t know that Istanbul has its own Parisian-esque covered passageways right in the heart of its center! The hip neighborhood of Karaköy is full every day, but I prefer this area at night, when it’s all lit up and vibrant. You’ll find street art, lots of cozy lights and candles, and plenty of outdoor seating spilling out into the streets in the warmer months. The area around Mumhane Caddesi andAli Paşa Değirmeni Sokak, close to the waterfront, is particularly fun at night, filled with people enjoying drinks, dinner, and company. To get the best photo of the Hagia Sofia, I recommend walking away from it and towards the Blue Mosque, through the park that connects the two. That’s where you’ll find the best views! If you come in April or May, you’ll likely see some beautiful blossoming trees, and this view is also gorgeous if you happen to get lucky enough to visit Istanbul when it snows! If you want some beautiful detail shots, you shouldn’t miss the Spice Market near the end of the Galata Bridge in the Eminönü neighborhood of Istanbul. Dried roses, countless colorful herbs and spices, piles of yellow saffron – it’s a colorful wonderland. The architecture of the covered market is also worth photographing, and the vibe is less hectic than the Grand Bazaar. For a classic Istanbul Instagram shot, head over the Grand Bazaar, where you can pose with beautiful Turkish handicrafts like lanterns, plates, tiles, rugs, and more. This is one of the most touristic places in Istanbul so you’ll have to be patient with all the people and the friendly persistence of the vendors. Note that if you take photographs for a while in a place, you may be expected to purchase something. To be honest, I think that’s only fair for staging a photoshoot in the middle of someone’s workplace. So be kind to the people who work here and make a purchase if you can afford it. Budget: For a great budget-friendly hotel, you can stay in the single or double rooms at the Dreamers B&B. Colorful and cozy, the B&B boasts a fabulous location in Beyoglu, less than a kilometer from Taksim Square. You can explore all of Beyoglu from here, and then head to Sultanahmet when you’re ready to see the old city. Check pricing, reviews, and availability here. Mid-Range: For an affordable, yet trendy boutique hotel, we recommend Peradays. It’s perfect for all Istanbul visitors, from first-timers to Istanbul veterans. The lofted rooms are generously large, so you can spread out and relax after a long day of sightseeing. They also have two cats that live here, Pera and Daisy, which you’ll be happy to greet after counting cats all day when out in the city. Check pricing, reviews, and availability here. Luxury: Istanbul has no shortage of fabulous hotels, but we love Hammamhane, a boutique apartment-hotel that was originally a hammam, and the sister hotel of Peradays. Built in a historic hammam (Turkish bath), the suites are spacious and luxurious. Located in the heart of Cukurcuma, the antiques district, Hammamhane is within walking distance to art galleries, design stores, antique shops, and chic cafés. Check pricing, reviews, and availability here. Finally, make sure you always travel to Turkey with a valid travel insurance policy. Turkey is a safe place to travel, but accidents or theft can easily ruin your trip if you don’t have the travel insurance coverage to recover the losses. Recently my aunt fell on a train in France and needed surgery, but luckily her travel insurance covered the costs in full. Thank goodness! 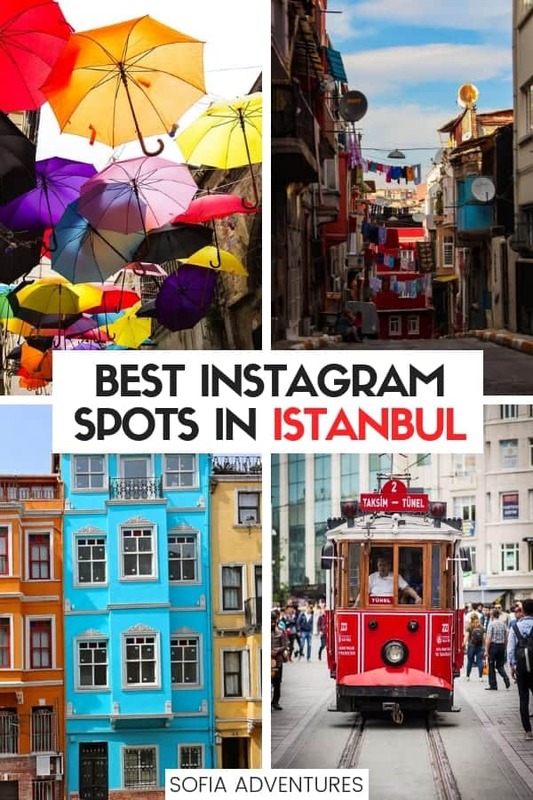 Pin this Instagramming Istanbul guide! I was in search of Instagrammable picture worthy location in Istanbul and was lucky to find yours. Thank you for providing the information and with address too. You are awesome! This is my 2nd time going to Istanbul and I have to take these wonderful pictures. Thank you! You’re welcome Priscilla! Tag us at @sofiaadventures so we can check out your posts 🙂 Have a blast!